This is my “take two” of Michel Richard’s Torte Milanese recipe. I did the first take last fall, when we prepared Richard’s homemade puff recipe and did other stuff with it. Pictures of that version were lost, unfortunately, and were never to be seen again, except perhaps by the hackers who encrypted them a few weeks later. Hope those bastards got hungry. 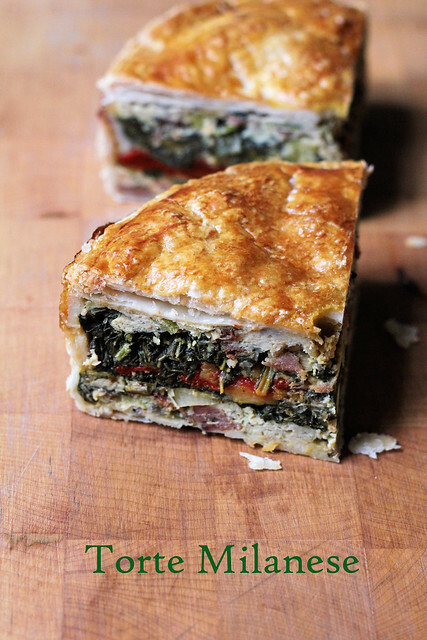 The only silver lining to all that mess is that I was encouraged to make this tasty torte, which is a full meal of layered scrambled eggs, cheese, veggies and meat encased in puff pastry, again. And I got to play around with it a little this time. I used chard in lieu of spinach for the greens, I left out the ham layer and instead crisped up some bacon and cooked them into the scrambled eggs, which I flavored with the herbs I had on hand (thyme and basil), and I used a mix of cheddar and Swiss cheeses. Even my roasted red pepper layer was actually a combo of red and yellow ones. I would say that the puff stayed the same, except I used store-bought instead of homemade this time. 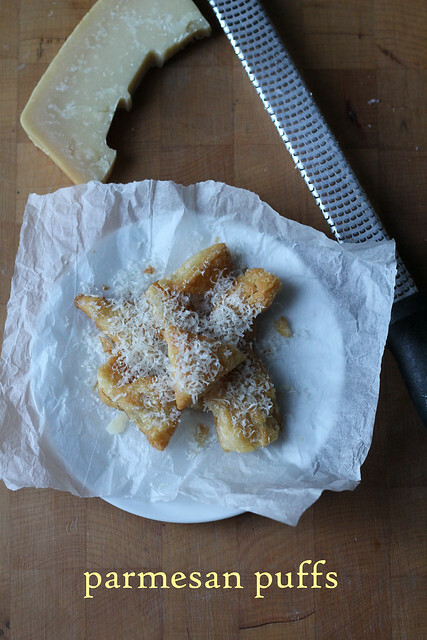 Its savory, salty (in a good way) and very filling. 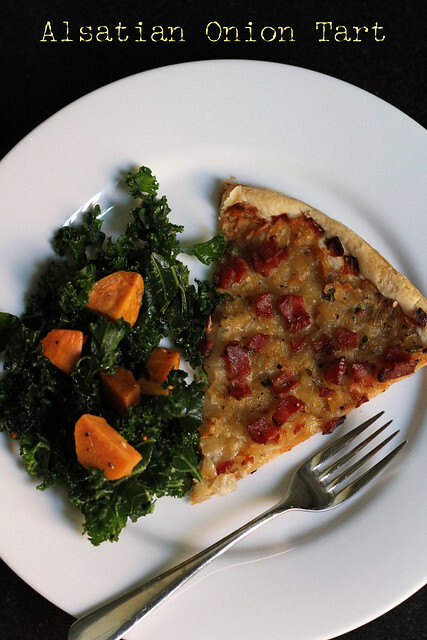 Plus, the tall slices look great with all those layers of good stuff. The recipe says to bake the torte at 350°, but I don’t think puff pastry bakes well that low, so I started it at 400° and turned it down at the halfway point for the rest of the bake. Michel Richard is a chef with a sense of humor. 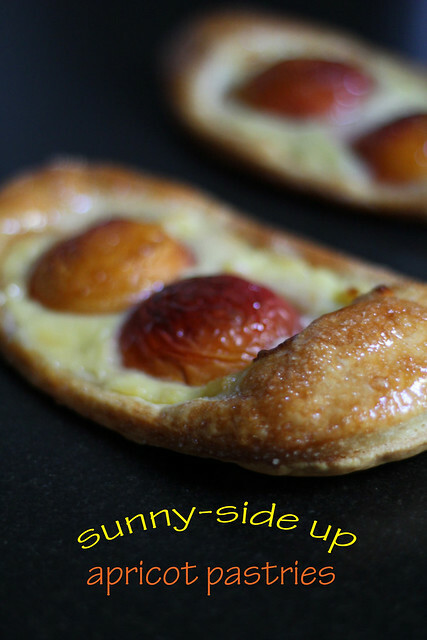 Case in point, these cute Sunny-Side Up Apricot Pastries. At first glance, they’re fried eggs on toast. At first bite, they’re poached fruit and pastry cream on top of crispy puff pastry. Before you can have these for breakfast (or for dessert, if you are like I am and this is too much to process in the morning), you have to make pastry cream and poach fruit. I’d take care of these a day in advance. You also have to deal with the puff pastry situation and decide if you are going to buy it or make it. I’ve worked in restaurant and bakery kitchens for more than 10 years now…while not every place I’ve worked has made puff from scratch, a few of them have, so I’ve laminated me some dough. Frankly, it can be a pain in the neck (literally). On a large scale, those of us with no upper body strength (who me?) struggle to roll a ginormous batch by hand if there isn’t a dough sheeter. If the kitchen’s too hot, butter oozes everywhere. It’s often a rush-job because no one bothers to mention that they took the last sheets from the freezer and left me with nothing for the day’s production. 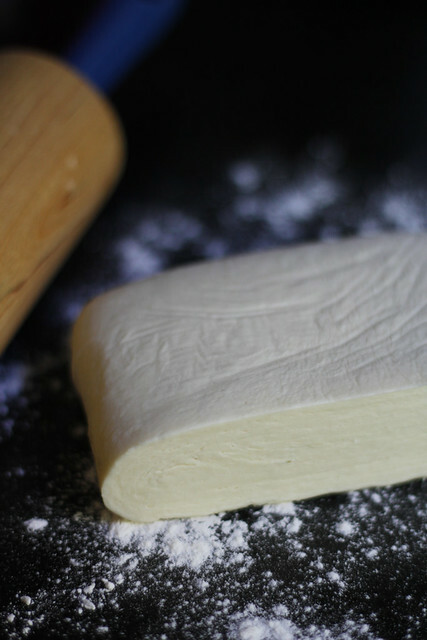 But, I’ve made this very puff pastry dough recipe at home before–I actually chose it several years ago when I hosted a Daring Bakers Challenge— and I know that it’s not hard at all, especially if you make it a day or two before you need it and the temps are relatively cool. If you are on the fence, a half-batch is super-approachable, doesn’t take too much counter space to roll and will give you plenty of puff for treats. And if you’re still on the fence, just get a nice store-bought one….I do it all the time, so no judgments. Apricots aren’t in season here anymore, so I had planned to just use canned ones instead (and also skip the recipe’s poaching step). Then at the Greenmarket this weekend, I saw that nectarines are still around, so I picked out a few of the smallest “apricot-sized” ones and went ahead with those. I gave them a gentle poach and left their skins on. I thought they were pretty, but they kind of wrinkled up in the oven. Next time they’re coming off. Next time I’ll also leave the puff a little fatter than the book indicates. I think the recipe says to roll it too thin, so while the front and back ends puffed nicely, the sides were a little flatter than I would have liked. Super crispy, though. 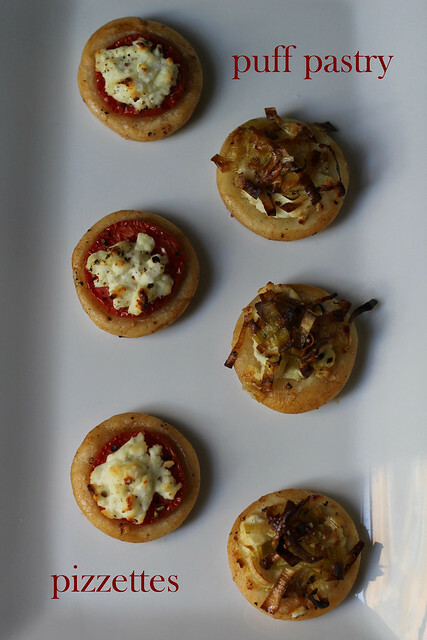 These were delicious, and a fun weekend kitchen project. I’ll make them again, especially since I have extra homemade puff in the freezer now. Here’s a document that I typed up about making puff pastry for my DB Challenge back in 2009…somewhere near the end are some tips and suggestions. For the recipe, see Baking with Julia by Dorie Greenspan (it’s also here). There’s a video of the BWJ episode showing how to make both the puff pastry dough and the pastries. Finally, don’t forget to check out the rest of the TWD Blogroll!